Maintaining control of noxious weeds is important to all Lake Gaston property owners. Weeds can affect the health of humans, habitats, livestock, wildlife and native plants. Controlling noxious weeds depends on the surrounding environment and habitats, the weed species, and the available financial resources and assistance from local and governmental agencies. The LGWCC serves as an advisory council to survey, monitor and protect the waters of Lake Gaston. Hydrilla is a Class 'A' noxious weed found in many lakes in southeastern United States including North Carolina. Hydrilla was first identified in Lake Gaston in 1988, although it is suspected that it was present for a few years before it was identified. Chara is typically found in clear, hard water. Lacking true stems and leaves, Chara is actually an algae. Unlike rooted plants, chara receives its nutrients from the water column. 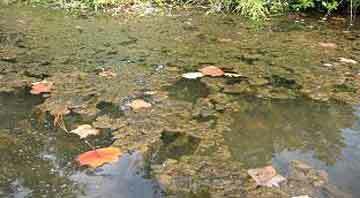 this makes it an idea competitor for available nutrients that undesirable algae require. Once established, chara can help to reduce turbidity that is caused by suspended particles and planktonic algae. Chara is sold by the bushel and is planted by simply throwing it in the water. It will grow in any part of the pond that receives sunlight. Lyngbya forms dense mats of cells protected by an external sheath. 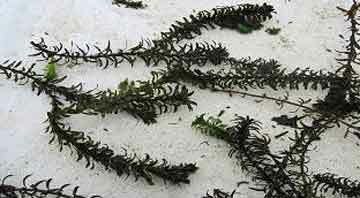 In the spring, the plant is black and then slowly becomes mottled with green, black and white filaments in late summer and fall. The picture below shows what the plant looks like on the surface.e. Shown above, the mats can surface or submerge based upon weather events. 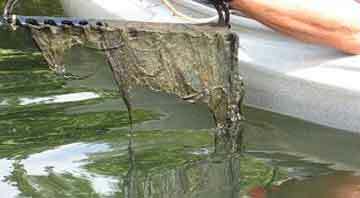 These mats resemble human hair when brought to the surface. 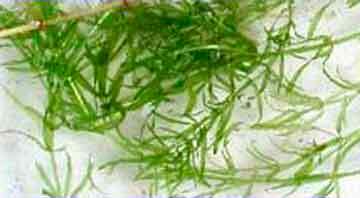 Egeria is a submersed, perennial weed. The stems are very slender (less than 1/4 inch) and long (greater than 6 feet). The leaves are whorled, and can have 3-6 whorls at each junction. Flowers are evident above the water surface, as they are borne upon pedicels that are 1-4 inches long. The flowers are white, with 3 petals and 3 green sepals. Flowers can be present throughout the year. 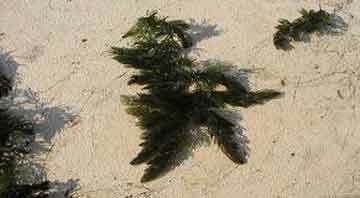 Brazilian elodea is similar in appearance to hydrilla, but elodea is usually larger and greener plant. This plant is competitive, and its habitat is lake, streams and rivers. 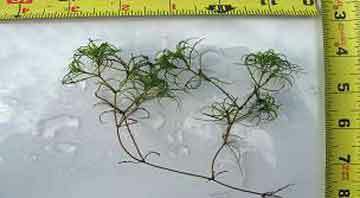 Eurasian watermilfoil is an aquatic plant with slender stems, and feathery leaves. The leaves are threadlike, typically uniform in diameter, and aggregated into a subermersed terminal spike. 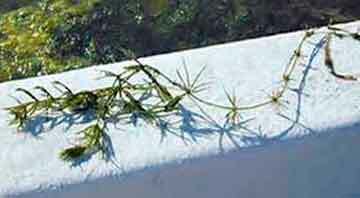 The plant also has small flowers in the axils of the plant that are located above the water surface. The flowers are either four petaled or without petals. The fruits are four-jointed. Coontail can be confused with milfoils, but does not have individual leaflets. Coontail is a submersed plant. It has no roots, and so is free floating. It grows in sluggish waters, and stems can reach lengths of greater than 15 feet. The feathery leaves are arranged in whorls or the stem (which can resemble a raccon's tail). Leaves are arranged in whorls of 5 or more. Each leaf is 1/2 - 3/4 inch long, and is dissected into linear segments that are toothed on one edge. These tiny teeth give the plant a rough feel when pulled through the hand. Coontail can grow in deep water, so deep that it may not be evident from the surface or the water. Coontail grows in the same areas that are preferred by Hydrilla. Brittle Naiad is a submersed annual plant that has many branched stems that can reach 4 feet in length. 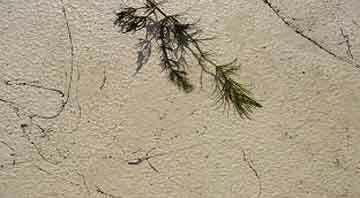 Leaves are opposite, linear, toothed, and 1 to 1 1/2 inches in length. As the plant ages it becomes more brittle. The plant can reproduce through seeds, as well as fragmentation and because it is brittle it can break off easily and become a new plant.